Like so many of my research books, this one's exactly what it sounds like. Unlike so many of my research books, this one's definitely intended for a popular readership. It's full of information while managing to be a fairly light and pleasant read. It's also quite pretty – there are lots of full-color illustrations, including a photo of a pair of gorgeously worn-out embroidered satin dance shoes. 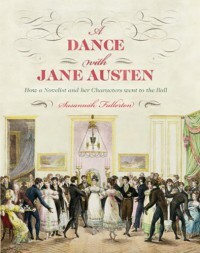 The information is presented in an engaging fashion, which is a decent accomplishment for a book that really is everything anyone ever wanted to know about Regency balls: clothing (men's as well as women's – dress correctly, gentlemen, or you might be barred at the door); transportation (sedan chairs in Bath, walking or carriages everywhere else); the dances (everything from a reel to a quadrille described in loving detail); the food served at the all-important supper (pineapple for dessert was the height of fanciness); even the fact that the dance right before supper was served was an especially significant one, since when that dance ended, "a gentleman accompanied his partner into the supper room, sat talking with her while they ate, and plied her with the best things from the table," providing "a wonderful courtship opportunity." If you're researching the Regency or are a full-on Austen fan, I recommend this book.